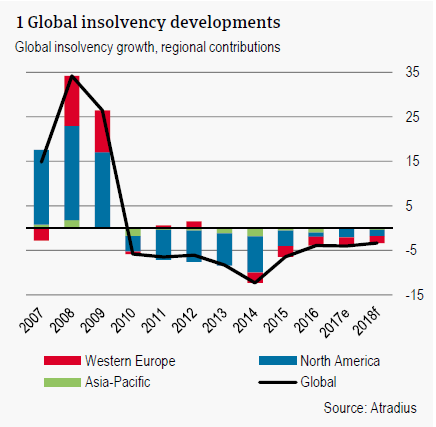 The global economy is in a sweet spot of broad-based economic growth and low interest rates, supporting a 3% decline in insolvencies in 2018. This is the ninth consecutive year of improvement. The UK is the only notable exception to this trend. However, the downward trend is beginning to bottom out and downside risks are rising as the period of easy money is coming to an end, especially in the US. Moreover, political risk remains a concern for Europe, which could negatively affect confidence. The global economy is enjoying a broad-based upswing in its economic cycle and this is translating into a better insolvency outlook for 2018. Strong industrial production growth, rising international trade and investment, and strengthening labour markets – all trends that have been sustained throughout 2017 – are expected to continue supporting the business environment through 2018. But after a decade of recovery, the pace of decline is expected to slow to 3% in 2018, following declines of 4% in 2015 and 2016. It is uncertain how long the current sweet spot will last as higher inflation accompanies stronger growth across many advanced markets, possibly raising the pace of global monetary tightening. After years of cheap funding driving higher non-financial corporate debt, higher interest rates could reverse the downward trend in insolvencies. The eurozone economy is enjoying strong cyclical momentum. A broad-based economic recovery, which was already underway last year, is expected to continue in 2018. Sentiment indicators are already exceeding 2007-highs. Private consumption remains the most important growth driver. Inflation remains subdued, supporting real household income. Investment is clearly picking up as overcapacity is absorbed. Growth is being supported by favourable financial conditions. According to the latest bank lending survey by the ECB, credit standards on loans to households continue to ease, while those for enterprises remain unchanged. Bank lending growth remains strong. The risks surrounding the eurozone outlook are more evenly balanced. Political risk has receded since the landslide victory of Emmanuel Macron in France, but political issues remain a downside risk for 2018. Italy will hold parliamentary elections on March 4, and polls show a weakening popularity among the pro-European ruling socialist party versus more nationalistic parties. The political crisis in Catalonia remains unresolved. It also remains unclear what the outcome of the Brexit negotiations will be. 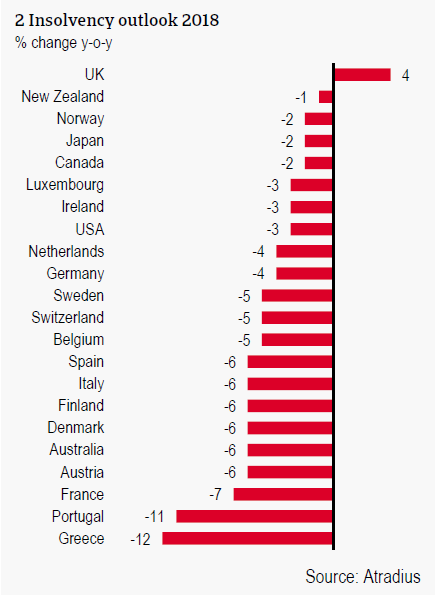 The decline in insolvencies is led by the southern European countries Greece and Portugal. In Greece, GDP increased by 0.3% in Q3 of 2017 and in 2018 the economy is forecast to expand by 2.3%. Growth is expected to be driven by rising household expenditure and strong export expansion. Corporate failures are forecast to decline by 12% in 2018, following a decline of 8% in 2017. The absolute level of insolvencies, however, remains almost three times that of 2007. The level of insolvencies in Portugal is also around three times higher than in 2007, but a solid decrease of 16% in 2017 and 11% in 2018 could bring it down to about 210% of pre-crisis levels. The Portuguese economy is set for another year of robust growth, though slightly lower than in 2017. Spain is enjoying one of the highest growth rates of the eurozone. GDP growth is likely to continue in 2018, though may slow slightly from last year. Private consumption and investment growth remain key factors in driving growth. The labour market has been improving after very high unemployment, but the rate of job creation may slow somewhat from 2017 levels while unemployment levels remain high. Meanwhile inflation, though tepid, will constrain real disposable income growth. Therefore, GDP growth, while still strong, is expected to slow down in 2018 compared to last year. From 2014 to 2016, Spain saw double digit declines in the annual number of insolvencies. Bankruptcies are expected to decline by 6% in 2018, following a 2% decline in 2017 in which H1 data came in disappointing. Spain’s annual number of insolvencies is still roughly four times its 2007 levels, the highest of the surveyed countries. The economic momentum in Italy also remains strong, with GDP forecast to grow by 1.4% this year. Growth in Italy is moderate, but broad-based, and will continue to be driven mostly by exports and investments. Consumer and business confidence are both very high. Employment is improving slightly, with some cautious signs of wage growth picking up as well. The level of insolvencies is forecast to decline by 6% in 2018, following a strong 2017 (-13%). A number of downside risks continue to cloud the horizon. The most prominent risk remains the March 4 elections, which runs the risk of creating a political stalemate, with possible negative effects on confidence. The Netherlands enjoys strong cyclical momentum. Business and consumer confidence are nearing 2007-highs. The economic momentum will continue in 2018, with private consumption and exports underpinning GDP growth. Between 2014 and 2017, the level of insolvencies declined by double digits. As the level of insolvencies is already much below 2007, we forecast a relatively modest further decline of 4% for 2018. Germany has also enjoyed strong, broad-based GDP growth in recent years. Business sentiment is very high, while credit growth is solid as well. GDP growth is forecast to amount to 2.4% in 2018, roughly the same level of growth that was attained last year. Bankruptcies are expected to decline by 4% in 2018, following a 6% decline in 2017. France appears reinvigorated after the election of Emmanuel Macron. The French economy enjoyed a very solid end to 2017, with GDP expanding by 0.6% in Q4, bringing growth in 2017 to 1.9%. In 2018 the economy should begin to feel the impact of pro-growth reforms. Investment is likely to pick up, underpinned by strong business confidence and higher infrastructure spending. This creates a benign environment for insolvencies, which are forecast to decline by 7% in 2018, bringing the annual count to below pre-crisis levels. Corporate bankruptcies fell 4% in the United States in 2017. This was in line with the solid 2.3% growth in GDP, robust jobs growth and high business confidence. The positive trend however masks some negative developments. Bankruptcy filings in the oil & gas sector rose, as a result of low energy prices. Furthermore, the retail sector is also struggling. Insolvencies among US retailers reached a six-year high as consumers increasingly turn to e-commerce. The US economic outlook for 2018 is even brighter with 2.8% growth now forecast – a significant upward revision following the announcement of tax reform. This bill, alongside regulatory rollbacks, has contributed to elevated business confidence. We expect this to stimulate higher corporate investment and business activity, which in turn should further lower insolvencies. However, the US is now in one of its longest recovery periods– bankruptcies have been falling for eight consecutive years and are now 20% lower than 2007 levels. That is why we predict a modest 3% decline. Downside risks for US insolvencies are also increasing and may materialise more quickly than expected as pro-cyclical policy may accelerate monetary tightening. US firms also face political risk, especially as regards to trade policy. The UK economy surpassed expectations with a steady 1.8% expansion in 2017, but insolvencies ticked up slightly (+2%), in line with our projections. Industrial production grew 2.1% in 2017 – the highest rate in seven years, driven by high manufacturing output. Higher global economic growth and Sterling depreciation, benefitting UK export competitiveness, have contributed to very positive business surveys. In spite of this, investment has been constrained amid uncertainty related to Brexit. Insolvencies ticked up for the second year in a row. Correcting for ‘bulk’ insolvency events – with many companies filing for bankruptcy, particularly in the administrative sector, due to changes to claimable expense rules – insolvencies still rose 2% in 2017. Insolvencies remain concentrated in the construction, retail, and hospitality sectors. We predict this upward trend in insolvencies to carry into 2018 with a further increase of 4%. Despite a stronger economic outlook (1.8%), lower consumer spending power amid higher inflation and lower business investment amid higher uncertainty as Brexit approaches are likely to prove obstacles to many firms.